Book on Drone Metal by Oaken Palace Trustee Published! 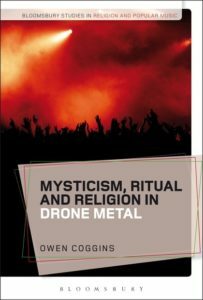 A book, Mysticism, Ritual and Religion in Drone Metal by Oaken Palace trustee and doctor of drone Owen Coggins is published on 25th January by Bloomsbury Academic. Based on several years of research about how audiences understand and respond to religious sounds and symbols in drone metal, the book explores how ideas of mysticism and religious experience in drone metal relate to similar discussions around dub reggae and psytrance, and describes how the marginal status of drone metal in relation to other metal and experimental musics allows an emphasis on listener experience in constructing genre. Then a chapter discusses the prevalence of the themes of pilgrimage and imaginary ‘elsewheres’ in how people describe listening to drone metal, before arguing that it is the first form of metal (or popular music for that matter) where the amplifier is the most important instrument, more central even than the electric guitar. This is then related to other amplifications and distortions, for example in heavy gothic lettering favoured by many metal bands, which can also be associated with mysticism and arcane or archaic ritual. “the requirement of attentive listening to appreciate the long-form pieces; the minimalist structure and slow pace of the music encouraging or demanding more active, imaginative participation in musical experience; a holistic intellectual and physical response to the music which promotes self-reflection, and even usage in meditative and contemplative practices”. Order HERE, or request that your library get hold of a copy! This entry was posted in General by Sven Lohrey. Bookmark the permalink.